The Nyingma School was founded in the eighth century by the great enlightened Indian master Guru Padmasambhava or Guru Rinpoche and is the oldest of the four schools of Tibetan Buddhism (Nyingmapa, Kagyupa, Sakyapa and Gelugpa). “Nyingma” literally means “ancient,” and the school is often called the “school of the ancient translations” or the “old school”, because it was founded on the basis of the first eighth century translations of Buddhist scriptures from Sanskrit into Tibetan. In modern times the Nyingma lineage has been centered in Kham in eastern Tibet. 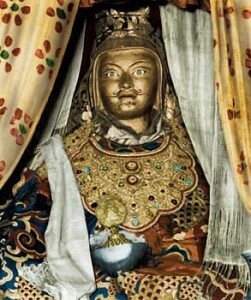 Six great monasteries of the Nyingma tradition developed in Tibet. These are Dorje Drak and Mindroling in the upper region of Tibet, Shechen and Dzogchen in the middle and Kathog and Palyul in the lower region.